It was suggested that I start this blog as an outlet to what's been going on with my family, specifically the situation surrounding my 10 month-old daughter, Chloe. Feel free to ask questions but respect the fact that we desire to keep the situation off of Facebook. Skip ahead to about two weeks ago when Kev and I were at the Ottawa Ikea after visiting a friend in the Ottawa General Hospital. Chloe had started doing the movements after having woken up from a nap and I (again) shrugged it off as I placed her into the shopping cart. Suddenly Chloe had a movement so forceful she bashed her face into the shopping cart handle, I mean HARD! I picked her up, waiting for the bloodcurdling cries to start and nothing. I looked at her and again she had a forceful movement and bashed her face into mine and it HURT! Nothing, not a peep from her. She had a few more not-so-strong movements then was back to regular Chloe. I looked at my husband and we were both a bit shocked. Chloe is by no means a whiner but she is a baby and babies cry, except then. The first thought that came to mind was "Seizure!". I decided to post one of the videos of Chloe doing the movements on Facebook to see if anyone could maybe help me out. Most people passed it off (as we had) to simple baby stuff but a good friend, MB, text messaged me and asked if I had though it could be seizures. She also said "not to alarm you, but it could be something called Infantile Spasms" and if they were that that I should take Chloe to a hospital (we had just moved and didn't have a pediatrician). I'll be honest, I was ready to go immediately but Kevin, knowing I'm prone to panicking, suggested we wait till the following day and head to a clinic. The following day I awoke to Kevin telling me we were going to the hospital. At some point the night before JB, MB's husband, had emailed Kevin some information about Infantile Spasms and had also encouraged us to take Chloe in and armed with that info Kevin hit the Google hard and came across some pretty scary info: Cataclysmic epilepsy, sever mental retardation, death. I decided that rather then head to the closest Emergency Room (which was about 30 minutes away) I'd call CHEO (The Children's Hospital of Eastern Ontario) which was about 90 minutes away (conveniently attached to the hospital we had been at the day before!). I explained the situation (movements, no pedi, JB and MB's IS concerns) and was told by a really nice nurse to come on in, they wouldn't turn us away. 4 hours, 2 doctors and a few showings of the videos I took later we had an appointment for Chloe to have an EEG (booked for May 16th) We were thrilled with the speed of the appointment because a) it wasn't the next day so it wasn't so urgent that we freaked and b) it wasn't so far away as it make it seem like it was nothing. I was to keep an eye on the movements and track them. This past Monday we got a call asking if we can bring Chloe in on this past Wednesday (eep). So we go in for the appointment (at 1pm) where Jennifer, a nice tech hooked Chloe up (Chloe did NOT enjoy this at all). In all the test took about about and a half, just because Chloe was fighting sleep. 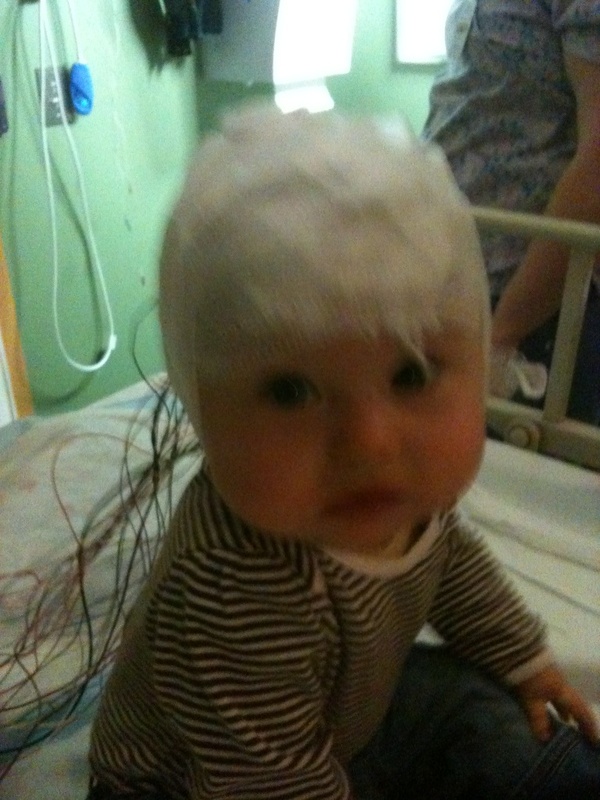 Now Chloe hadn't had any movements for two days so we were were a bit revealed when Chloe had one right in the middle of the EEG. After the nubbins were removed we were told to expect a call to see the neurologist within 3 weeks unless it was urgent. After thanking them we headed over the main hospital to get a bite to eat. Within 20 minutes we were called and asked if we could come in the following day to speak to the Neurologist, Dr. Sell. I'll be honest, I had a small panic attack, though thankfully it had passed because 5 minutes later they called me back asking if we could come in right then since we were next door and that the Dr wanted to talk to us that day. Glad you found a good outlet. Praying for you guys.